Bali White Water Rafting is spectacular experience on the great water rafting with amazing panorama of riverbank and surrounding area. 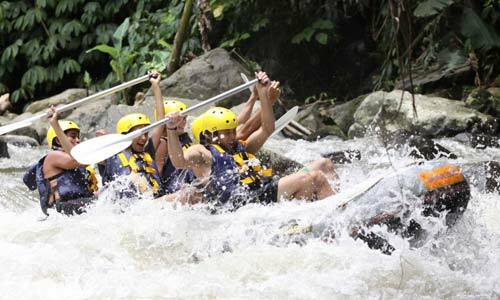 Bali White Water Rafting offers you a chance to join this exciting water adventures. 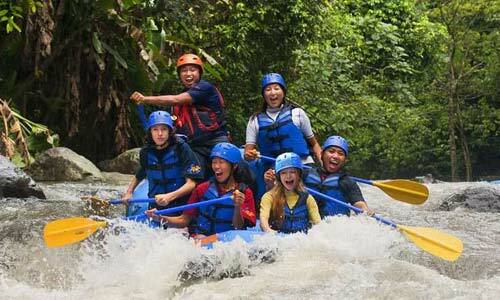 The river rapid will bring you on the fun experience during your vacation in Bali. It is located at two famous river in Bali where give more choice to join this fun water rafting at Ayung River in Ubud and Telagawaja River at Karangasem regency. Both of river providing the great water adventure with the beautiful scenery and landscape and also the original nature a long of river. Some of rafting companies with the professional river guide serve you on this tour which has been selected as the recommendation rafting company like Alam Amazing adventure, Bali International Rafting, and Ayung River Rafting. Tracing the river with its wild and original nature can make ourselves as if we are in the real jungle of paradise. The spring-fed of the river flows down through wild tropical jungle, passes towering trees and vines can create a thrilling beginner class rafting course. Important: In Bali there are two great rivers for water activities there is Ayung River and Telaga Waja River, both of that river have own uniqueness to make your holiday in Bali Is memorable one. Please do not hesitate to contact us if there information that we provide is not clear. TWR Rafting will Begin your water adventures at Telaga Waja river in the east part Bali below the great of Agung Mountain. Once you paddle on the river, TWR Rafting will bring you to entering the secret beauty of Bali through the pure nature, wild tropical forests, over hanging trees and vines creating a thrilling beginner-class rafting course. As the first company to do activities rafting in Bali, making Sobek Rafting is very popular among tourists visiting Bali. This company has experienced more than 20 years of rafting adventure in Bali. As a company that does activities rafting on the Ayung River with the class rapid is 2 - 3 will give disproportionately experience for your holiday in Bali. ALAM Amazing Adventure know well as ALAM Rafting is a Bali rafting company on the Telaga Waja River is most popular river. Striking with a bright yellow color that is very easily recognizable. Amazing natural surroundings maintain rafting dedicated to donating a percentage of income from this activity. Bali Adventure Tour is one company that is very famous rafting company in Bali. This company has a very well maintained rafting equipment, guides who will guide you in a rafting activities. 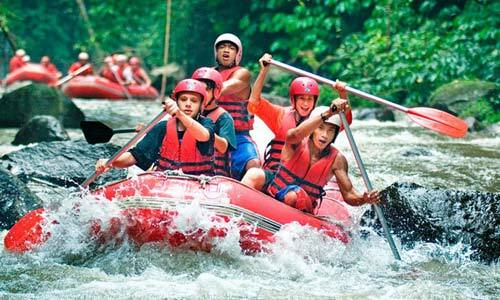 Bali International rafting is one of the companies that are doing these activities in Telaga Waja River. With amazing views of the river, the water flowing down from the mountains in the eastern part of the island of Bali makes it more challenging adventure. Its cool weather will pass through the cliffs provide a fantastic experience adventure rafting on the river. As one of the best and professional Bali rafting company, BMW Bali Rafting will be the best choice for your rafting trip in Bali. Own by the local community, BMW Bali Rafting employs professional young local people who have more than 10 years of experience in white water rafting industry.